Douglas Martin (born January 13, 1989) is an American football running back for the Tampa Bay Buccaneers of the National Football League (NFL). He was drafted by the Buccaneers in the first round of the 2012 NFL Draft. He played college football at Boise State. Martin was born in Oakland, California, in 1989 and grew up in Stockton, California, where he attended St. Mary's High School. He was a letterman in football and track. As a junior, Martin rushed 228 times for 1,950 yards and 18 touchdowns, earning first- team all-selection and all-area honors by the Stockton Record and All-San Joaquin accolades by Comcast Sports. During his senior season, Martin rushed for 1,234 yards on 171 carries and 14 touchdowns winning the team's MVP award. In track & field, Martin recorded a personal-best time of 11.15 seconds in the 100-meter dash as a senior. In addition, he also had top-jumps of 6.69 meters (21 ft, 11 in) in the long jump and 13.20 meters (43 ft, 3 in) in the triple jump. Martin had interest from bigger programs such as California and Oregon State, but committed to Boise State on December 14, 2006. Martin (center) dives for a TD while playing for Boise State. Martin attended Boise State University from 2007 to 2011. He finished his career with 3,431 yards on 617 carries with 43 touchdowns. As a senior in 2011, Martin was the MVP of the 2011 Maaco Bowl Las Vegas after returning the opening kickoff 100 yards for a touchdown and rushing for 151 yards and a touchdown. Throughout his college career, Martin started 25-of-51 games at Boise State and was a first-team All-Mountain West Conference selection in 2011 and All-Western Athletic Conference in 2010. Martin ranks third in school history with 43 rushing touchdowns and 48 total touchdowns, fifth with 3,431 rushing yards and sixth with 617 rushing attempts. Martin was nicknamed "Muscle Hamster" by his Boise State teammates due to his strength and small size. The Tampa Bay Buccaneers selected Martin with the 31st overall pick of the 2012 NFL Draft, making him the first player from Boise State University to be drafted by the Buccaneers. On June 4, 2012, Martin signed a 5-year contract, worth $6.787 million with the team. After a successful 2012 preseason with the Buccaneers, where he rushed for 97 yards on 27 carries to go with 2 rushing touchdowns, Martin was officially named as the starting running back entering the 2012 regular season by coach Greg Schiano. On October 25, 2012, Martin rushed for 135 yards and 1 TD and caught 3 passes for 79 yards and 1 TD in a 36-17 win against the Minnesota Vikings. One week later, Martin rushed for 251 yards and tied the NFL record for rushing touchdowns in a half with 4 in a 42-32 road win against the Oakland Raiders. In the game, Martin became the first player in NFL history to score touchdown runs of 70-plus, 45-plus, and 65-plus yards in a game, and is the second player in league history (along with Mike Anderson) to run for 250+ yards and four touchdowns in a game (coincidentally, they both ran for exactly 251 yards and were both in their rookie seasons). Martin also broke the franchise records for rushing yardage and touchdowns in a game. At the end of the 2012 NFL regular season, Martin finished with over 1450 yards rushing and nearly 500 yards receiving. Martin's 1926 yards from scrimmage in a single season ranks him second in Buccaneers' history behind James Wilder (2229 yards from scrimmage). His 1454 rushing yards broke the Buccaneers' single-season rookie rushing record that was previously held by Cadillac Williams (1178 rushing yards). On January 4, 2013, Martin was announced as one of five finalists for the 2012 NFL rookie of the year award while earning a trip to the 2013 Pro Bowl as first alternate. On September 15, 2013, in a game against the Saints, Martin rushed for 144 yards on 29 carries. Martin suffered a shoulder injury against the Atlanta Falcons on October 20, 2013. He was placed on the season-ending IR on November 8, 2013 because of a torn labrum. Before the season, the Buccaneers declined picking up the fifth-year option of Martin's rookie contract, which would have allowed him to become a free agent after the season. In week 11 vs the Philadelphia Eagles, he ran for 235 yards on 27 carries, averaging 8.7 yards per attempt. Following Martin's resurgent season he was selected for the 2015 Pro Bowl, the second of his career, and became the first Buccaneers running back to be named a First-team All-Pro. On March 9, 2016, Martin signed a 5-year, $35.75 million contract extension, keeping him with the Buccaneers through the 2020 season. Martin visited youth at All Children's Hospital in St. Petersburg and sang holiday carols to residents at Westminster Palms retirement home in December 2012. ↑ California Birth Index. "Douglas Matthewbaran Martin, Born 01/13/1989 in California". California Birth Index. Retrieved October 12, 2015. ↑ "NFL Draft Scout". NFL Draft Scout. 2006-09-21. Retrieved 2012-09-24. ↑ "Boise St. cruises to easy bowl win in Las Vegas against Arizona St". Scores.espn.go.com. 2011-12-22. Retrieved 2012-09-24. ↑ Smith, Michael David (6 November 2012). "Doug Martin: I can't shake Muscle Hamster, "worst nickname ever"". ProFootballTalk. NBC Sports. Retrieved 25 November 2013. ↑ "NFL Events: Combine Player Profiles - Doug Martin". Nfl.com. Retrieved 2015-10-07. ↑ Tust, Jay (2012-04-26). "Doug Martin drafted by the Buccaneers | KTVB.COM Boise". Ktvb.com. Retrieved 2012-09-24. ↑ "Doug Martin shatters Tampa Bay Buccaneers' records". National Football League. 2012-11-04. Retrieved 2012-11-04. ↑ "Martin on Rookie of the Year Short List". Tampa Bay Buccaneers. 2013-01-04. Retrieved 2013-01-05. ↑ Patra, Kevin (May 4, 2015). "Buccaneers decline fifth-year option of Doug Martin". NFL.com. Retrieved November 14, 2015. ↑ "Doug Martin agrees to five-year deal with Buccaneers". NFL.com. Retrieved 2016-03-10. ↑ "Tampa Bay Buccaneers Rushing Career Leaders". pro-football-reference.com. Retrieved January 8, 2016. ↑ JIM TROTTER (November 26, 2012). "Hamster, Daaamn!". Archived from the original on March 17, 2013. 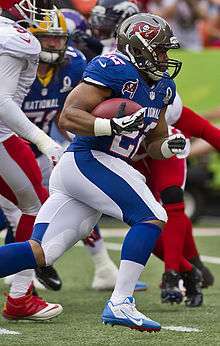 Wikimedia Commons has media related to Doug Martin (running back).